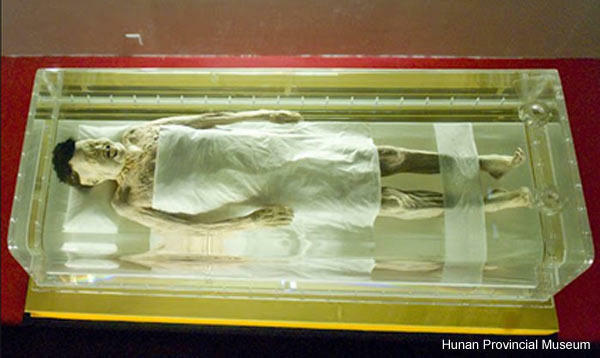 The Lady of Dai, also known as The Diva Mummy, is a 2,100-year-old mummy from the Western Han Dynasty and is the world's best preserved ancient human ever discovered. Just how this incredible level of preservation was accomplished has baffled and amazed scientists around the world. In 1971, at the height of the cold war, workers were digging an air raid shelter near the city of Changsha when they uncovered an enormous Han Dynasty-era tomb. The tomb was airtight, burried 12 metres underground, locked inside four layers of coffins. 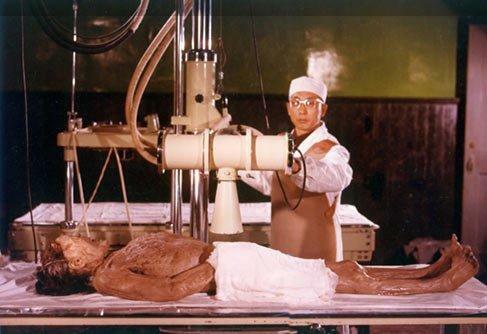 Her body had been swaddled in 20 layers of silk and she was found in 80 litres of an unknown liquid ( scientists are still unable to replicate the liquid). The layers of caskets were put inside a compartment in the centre of a funnel shaped, clay lined, massive cypress, burial vault. Five tons of moisture absorbing charcoal was packed around the vault. The top was sealed with 3 feet of additional clay. Hard rammed pieces of earth filled the shaft all the way to the surface. No substance of any kind was able to get in or out of the sealed tomb. Decay-causing bacteria trapped inside would quickly die because of the lack of oxygen. Destructive ground water could not penetrate the sturdy barriers. The result of such diligent hard work that went into sealing and protecting the late Lady Dai, was a cool, highly humid, almost sterile, environment. Xin Zhui died between 178 and 145 BC, at around 50 years of age. The objects inside her tomb indicated a woman of wealth and importance, and one who enjoyed the good things in life. Found over 2,000 years after her death, her skin was still soft, and her arms and legs could still flex at the joints. Every feature is still intact down to her eyelashes and the hair in her nostrils, and blood still remained in her veins. When she was removed from the tomb, oxygen took an immediate toll on her body and so the state in which she is seen today does not accurately reflect how she was found. Nevertheless, when forensic scientists conducted an autopsy on the Diva Mummy, they were stunned to discover that the body was in the same state as an individual who had recently died. The autopsy revealed that all her organs were still intact, even down to the lungs vagus (nerve), which is as thin as hair. Blood clots were found in her veins and evidence was found of a coronary heart attack, as well as a host of other ailments and diseases. The Lady Dai died of a heart attack at the age of 50, brought on by obesity, lack of exercise and an over-indulgent diet. When they were still studying her organs, the pathologists found 138 undigested melon seeds in her oesophagus, stomach, and intestines. Melon seeds take about 1 hour to digest so scientists were able to determine that she died shortly after eating those melons. Archaeologists and pathologists have not determined all the factors behind her state of preservation, but they have a few clues.